Are you part of a Tri Club, Cycling Team, Swim Vlub or just group of friends looking to get away? We can cater for up to 18 people in a mix of double, twin and triple rooms which are spacious and comfortably decorated, all are en-suite or with own bathroom. Villa Paraiso caters for up to 18 people in a mix of double, twin and triple rooms which are spacious and comfortably decorated, all are en-suite or have their own bathroom. The lounge is the perfect place to relax after a day’s training with Satellite TV, DVD and the villa has free Wi-Fi throughout. 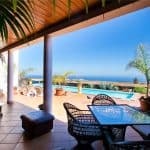 Villa is set in 2000m2 of landscaped sub-tropical gardens with a 25m heated training pool, large BBQ area, Bike room, Shop, Gym, Spa and large sun-terraces. NOTE: Group discounts apply for groups larger than 10 athletes and free places are available for Coaches - please ask for details and to avoid disappointment please ensure that you reserve your weeks well in advance. An introduction to the facilities at Villa Paraiso. These facilities are available to all of our guests. Breakfast, lunch, dinner, snacks and drinks supplied using home grown or locally grown fresh produce - we pride ourselves in clean living and supporting local business. Villa Paraiso is comfortable, spacious and modern. The bedrooms range from from the ``Penthouse`` ( 2 Bedroom, 2 Bathroom Suite) to doubles, triples, twins or singles. All bedrooms have en-suite or their own separate bathroom. We have washing machines and drying facilities located on site for your use. A Nominal fee of €1 is charged per wash. Laundry soap is provided. Our 25m 2-lane pool is heated to an average temperature of 26c throughout the year and is available at anytime during your stay. We have a few pool buoys and floats but recommend you bring your own pool aids. Villa Paraiso has an 8-seater luxury outdoor Jacuzzi, perfect for recovery at the end of a training day or just to relax in. Our secure bike room can hold up to 20 bikes. We also have an on-site mechanic that can assist with minor problems and all tools and a bike rack for your own use. No matter where you are staying in the Villa you will receive free WIFI. The Villa also has Satellite TV and DVD player. Our fully equipped gymnasium has a range of Kettle bells and dumb bells (from 1kg – 16kg). A weights bench and squat rack with 5kg, 10kg and 15kg weights. TRX, Bosu, spin bikes and turbo trainers, gymnastic balls (different sizes), plus Yoga mats and rollers. We have WiFi in the gym and a speaker system that you can Bluetooth your music to! And for fun we have a Pool Table and Table Tennis for all you competitive folk. We have forged relationship with some of the best sports associated services offered on the island. This saves you the research, trial and error. For athletes that are bringing their own bikes, but are not entirely sure how comfortable they will be from day after day of cycling, we have our own in-house Retül Bike Fitter, Judith, whose business DR J Performance has been providing our athletes at Tri-Sports Lanzarote with bike fits for the last 2 years. For those unfamiliar with the Retül system, it uses state of the art dynamic, 3D technology to measure your position on your bike (unlike many systems, it is used with your own bike). The angles are then interpreted to find your optimum position based on your cycling history, goals and biomechanics. A bike fit session provides you a thorough biomechanical screening, discussion and advice on how your personal flexibility, imbalances and cycling goals will affect where your optimum position is on your bike. The Fitter will make any changes needed. If there are alot, she will advise you to adjust your bike gradually to get used to the new position. You will also get a full report that includes all your bike measurements as well as any recommendations for strength work that she feels as a coach will help to get the most out of your cycling. Our secure bike room can hold up to 20 bikes. We have an on-site mechanic that can assist with minor problems and all tools and a bike rack for your own use. Bike assembly and dismantle is available at an extra cost. TRI-SPORTS Lanzarote ‘sea swims’ are held along the main ‘Playa Grande’ beaches of Puerto Del Carmen. Our swim routes are parallel to the main beaches, keeping it shallow, but also out of any currents… you can even swim the famous ‘Lanzarote Ironman’ swim. Sea Temperatures ranges from 18c in winter to 24c during the summer months. Wetsuits are not necessary but strongly advised in the winter months. Pool training sessions take place on-site in our 25m solar heated pool. We have 2 lanes for differing levels or large groups, and the pool is available at any time during your stay with us. Video Analysis is available with pool training. Some swim aids are provided but we recommend you bring your own. Our bike routes are some of the most breathtaking in the world. Whether it’s a short 20k, or a gruelling 180k (Ironman distance) we can ensure that it’s a journey you’ll rate up there with the best. From the white sandy beaches of the south, the palm tree lined winding streets of the North, to the outstanding 500 volcanoes in-between, we promise your ride will be breathtaking at every turn. Routes are for all abilities – beginners, intermediate or advanced. No matter what your level we have the perfect bike route for you. We can arrange to take photos and video footage if required. When you participate in our scheduled runs, you can chose between beach, road or off-road runs. For the ‘road’ runs, TRI-SPORTS Lanzarote will take you for 5k, 10k or 20k, along the beachfront promenade in Puerto Del Carmen - the route for the ‘Lanzarote Ironman’. The specially designed ‘running path’ sits alongside white sandy beaches and offers slight inclines and declines for beginners and professionals alike! If you fancy something a little more adventurous, come and join us for one of our ‘off-road’ runs. The tracks we use, of varying lengths, take us through the amazing countryside of Lanzarote…. around, or up and down Volcanoes. Depending upon your ability, we can provide a challenging run over tarmac road, Lanzarote ‘picon’ (the black lava gravel), or over rugged terrain. We can also arrange the use of a local running track. Participants must come prepared for the heat and terrain with good shoes, hat, sun cream and water bottle carrier. We can send you Garmin Files to download prior to your Training Camp of the Bike and Run routes directly from the villa.